Sign up and receive Property Email Alerts of Freestandings for sale in Nuutgevonden, Stellenbosch. 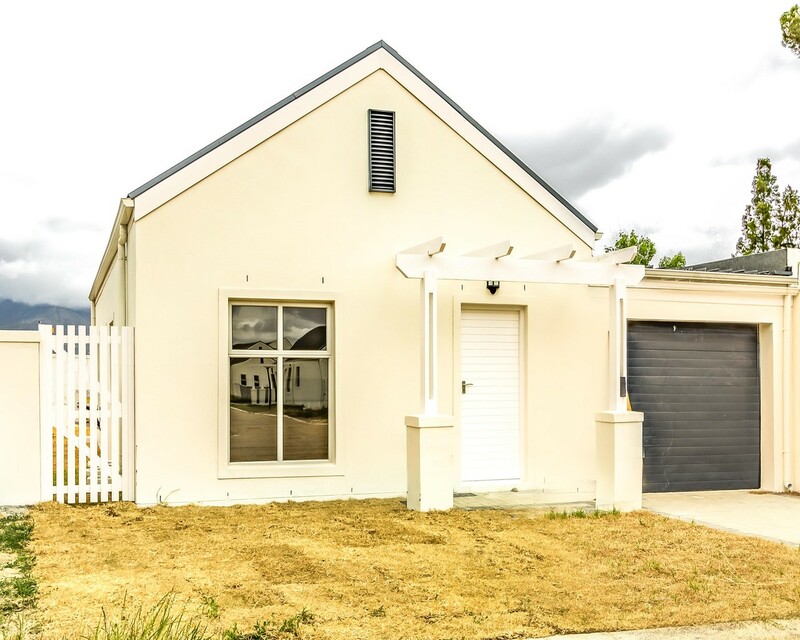 This lovely and cosy home is ideally located in a fully Security Estate nestled within the Stellenbosch Winelands surrounded by the Welgedact, Nuutgevonden and Nooitgedacht Estates. This peaceful and tranquil village with panoramic views of the Simonsberg and Helderberg Mountains, is nestled alongside the Plankenburg River, just 4 km from the Stellenbosch University, with easy access to the N1 & R44 and other business districts of Cape Town CBD, the Northern Suburbs and Boland. This security village offers the residents the comfort of living in a secure environment with 24hour manned security and a 2,1m high perimeter wall with electrified fencing with additional security provided by access via Nuutgevonden Estate. The home has direct access to the landscaped communal open spaces and offers beautiful modern internal finishes. The home offers the following property features: 2 bedrooms with built in cupboards, 2 bathrooms, with an open plan kitchen fitted with modern styled built-in-cupboards, electric oven and hob with splash back tiles and granite counter tops, a double sink and a plumbing point for a front-loader washing machine/dishwasher adding convenience, a single automated garage with additional open parking for one vehicle in the driveway. This estate offers a high tenant demand and capital growth and is ideal for first time home buyers and keen investors. Please contact me if you are interested in a private viewing appointment. Sign-up and receive Property Email Alerts of Freestandings for sale in Nuutgevonden, Stellenbosch.